The first Kentucky Fried Chicken franchise opened in 1952, and it has grown into the second-largest restaurant chain by sales (second only to McDonalds). But America isn't the only place enjoying the Colonel's chicken - KFC arrived in China in 1987. 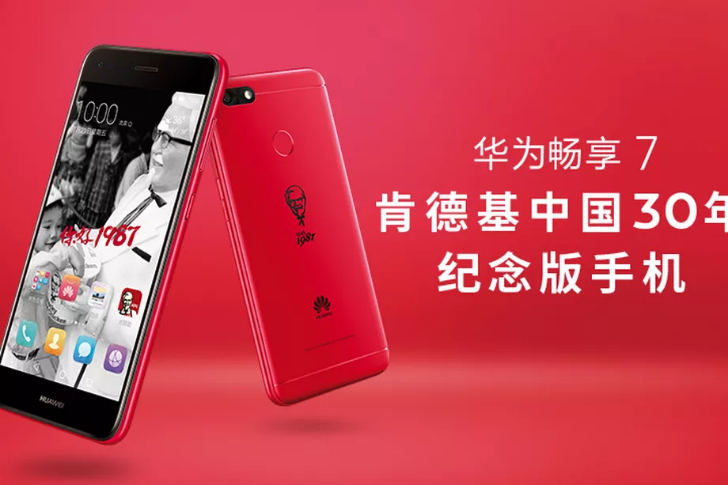 To celebrate 30 years of KFC in China, Huawei is making a KFC-branded smartphone. It's called the "KFC Huawei 7 Plus," and is powered by a Snapdragon 430 processor, 3GB of RAM, and 32GB of expandable storage. It also has a fingerprint sensor and a 3,020mAh battery. Colonel Sanders is embossed on the back of the phone, so everyone knows you have good taste in chicken. It also comes with a KFC-branded music app pre-installed, which allows users to create and share playlists at KFC restaurants. Huawei will only be manufacturing 5,000 of these phones, and they will be available for 1,099 yuan (about $162 USD) from July 13. It's the perfect companion for the Pepsi phone.